Linlithgow Rugby Club boasts the only Rugby Club Male Voice Choir in Scotland, with a repertoire that includes Scottish favourites, classical & popular anthems plus songs from the shows. The Choir was founded in 1991 under our current Conductor Mr. Joe Lavery and still has some of the original members singing with it, including Musical Director Jim McGuigan. 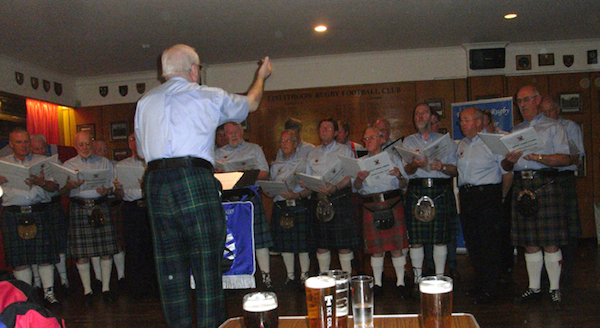 The choir’s original raison d’être was to reciprocate rugby choral hospitality by entertaining visiting rugby teams and supporters during their visits to Murrayfield for international matches. Over the years our scope has vastly extended and we are now very active both locally and much further afield, supporting many local and national institutions and charities. 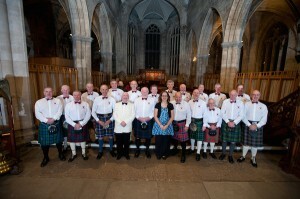 We have toured overseas in China and Canada as well as singing in both Northern and the Republic of Ireland. In the UK, as well as participating in many local concerts, we have joined with other choirs to sing at The Royal Albert Hall in London and The Usher Hall in Edinburgh.